Since the last newsletter the Association has been fairly active. 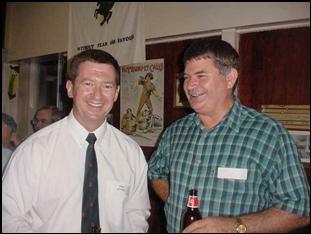 Firstly on 16 March 2001 we held the annual Back to the Regiment Night. This was very successful. Approximately 60 members from all eras attended and all seemed to have a good time- particularly those who deliberately avoided watching Zulu for the 20th time. The night was also good for new members. I wish to welcome Chris Goodhew, Sue Goodhew, David Brilliant, Damian Copeland, Wayne Jenkins John White and the former Commanding Officer Wayne Lynch as members of the Association. I wish to also thank those members who have renewed their membership. 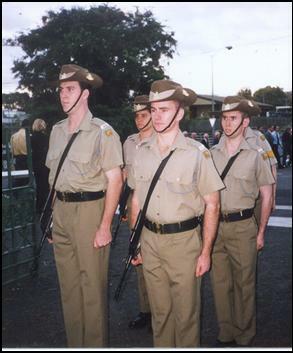 The Association supported the Regiment at Anzac Day on Wednesday 25th April 2001. The service was held at Sylvan Road Toowong. After this breakfast was held at the Regiment. We paid for the breakfast provided to the members of the unit, the Association and the Toowong sub branch of the RSL. All have reported the Anzac service to have most moving. About 25 members of the Association attended the service. The next major event on the calendar will be the AGM to be held at the United Service Club on Friday 14th September 2001. It will be much in the same format as last year. Please consider whether you are willing to serve on the Committee in 2001/2002. The Association presented a prize to the outstanding Officer Cadet at the Regiment. We are still in the process of gathering as many E mail addresses so that we may more efficiently communicate with our members. Please advise as to your E Mail address if you are not on the list. At present past COs of the Regiment are working on the drafts of their times as CO. We hope to have to have this task completed fairly quickly. As always contact me if you have any suggestions or queries. » Some photos from the Back to the Regiment Night, Anzac Day and the Officers Mess Regimental Dinner. I am very pleased to have the privilege to have been appointed as the Commanding Officer. There is a certain sense of satisfaction to return and to command the Regiment from which one graduated. I am enjoying the challenge of command and especially the responsibility of ensuring the quality of training for the Officer Cadets that will serve with the Regiment and later with the Reserve in general. 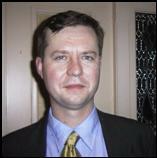 By way of introduction, I shall outline my Reserve career since leaving the Regiment as a graduate in 1981. I was commissioned into the Royal Australian Engineers where I gained experience in a number of regimental and staff appointments. As a sapper, I even made the occasional professional visit to instruct on QUR’s Pioneer courses. 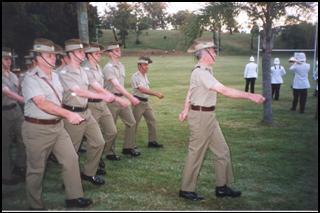 I formally returned to the Regiment in 1991 as 2IC of the Senior Company of Officer Cadets. My corps appointments culminated with command of 11th Field Squadron. I consider myself to be quite fortunate in that I have been on three operational deployments; in 1996 with the Cambodian Mine Action Centre; 1999 with the Peace Monitoring Group, Bougainville; and last year as the Commanding Officer of the Operational Search Battalion on Operation Gold, Sydney (Olympics and Paralympics). The next two years with the Regiment promise to be a continuation of change and development. Recent changes to legislation affecting Reserve service were implemented and a new Defence White Paper, Defence 2000, was released late last year. The full effect of these changes is yet to be felt. Recruiting is a significant issue for the Defence Force in general and will remain a challenge for the Regiment. We must ensure we receive sufficient applicants to meet our quota in both number and quality. The First Appointment Course continues to evolve and develop under the guidance and in cooperation with the Royal Military College-Australia. I shall endeavour to keep the Association informed as the Regiment progresses. I look forward to working with the Association and its members to maintain the fellowship of those who have served with the Regiment. The recent Regimental Dinner at Cromwell College was an outstanding success and an excellent opportunity for current officers of the Regiment to meet and converse with members of the Association. Finally, but in no way least, I heartily offer my thanks to LTCOL Wayne Lynch for handing the Regiment over in fine order and wish him all the best in his new posting at Regional Training Centre – South Queensland. The Association notes with sadness the untimely death earlier in the year of Lieutenant Colonel Gary Babon, RFD. 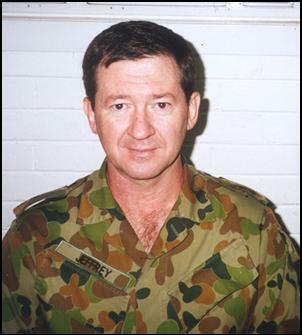 Gary served in the Regiment whilst an undergraduate in the 1960s, was commissioned to Infantry and served for a time with 6 RVR in Melbourne. Much of his subsequent service was undertaken in Western Australia and he was posted to the then 1st Training Group at Wacol on his return to Queensland in recent years. He will be fondly remembered by all who served with him as a fine soldier and a good bloke. 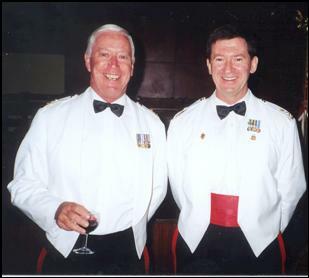 The changing of the guard: new CO Peter Jeffrey (left) with his predecessor Wayne Lynch at the Back to the Regiment Night. 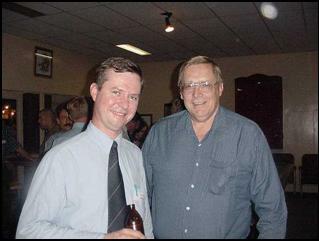 Association President Paul Smith with Peter (Horse) Thorne in the Standfast Club at the Back to the Regiment Night. 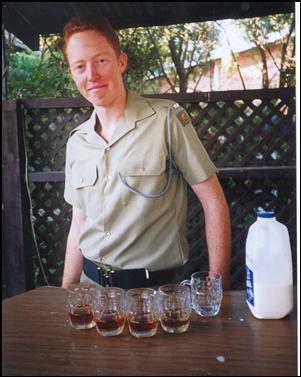 One of the Regiment’s current young soldiers ready to issue heart starting rations of rum and milk, one of the traditional components of the ‘gunfire breakfast’ held at the depot on Anzac Day. The QUR contingent marches on in preparation for the Anzac Day ceremony in Sylvan Road Toowong. The Engineer mafia? Major General Steve Golding, now the Regimental Colonel of the Royal Queensland Regiment, with the new CO at the Officers Mess’s Annual Regimental Dinner at Cromwell College just up the road from the unit’s Walcott Street depot.